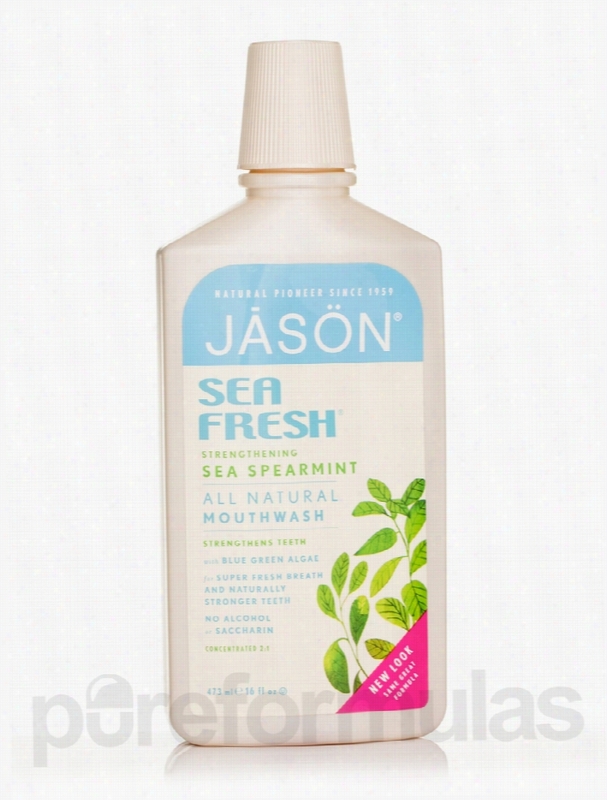 Jason Natural Products Oral Health - Sea Fresh Sea Peppermint. If you are looking for a mouthwash to refresh your mouth and toughen your teeth&sbquo; you may buy Sea Fresh&reg; Strengthening Sea Spearmint Mouthwash from Jason&trade; Natural Products. This herbal formulation contains the richness of botanical extracts and calcium to cleanse and strengthen your oral cavity. Aloe vera leaf juice has antibacterial and antifungal properties and might be beneficial in killing the germs in your mouth and strengthening your gums. Blue green algae contains calcium&sbquo; proteins and antioxidants&sbquo; and could come in handy in driving away germs and strengthening your teeth. Calendula officinalis flower extract provides the richness of antioxidants and grapefruit extract may act as an antiseptic in this mouthwash from Jason&trade; Natural Products. Echinacea angustifolia extract and witch hazel water could work as an astringent and antimicrobial agents to eliminate infections from your mouth. Goldenseal and perilla seed extracts may assist in reducing tartar buildup on teeth. Spearmint Oil may keep your breath fresh&sbquo; while ascorbic acid and calcium ascorbate strengthen your teeth and gums. Sodium bicarbonate and sea salt in Sea Fresh&reg; Strengthening Sea Spearmint Mouthwash from Jason&trade; Natural Products may whiten your teeth for that bright smile. These statements have not been evaluated by the Food and Drug Administration (FDA). These products are not meant to diagnoseÃ¢ÂÂ treat or cure any disease or medical condition. Please consult your doctor before starting any exercise or nutritional supplement program or before using these or any product during pregnancy or if you have a serious medical condition. 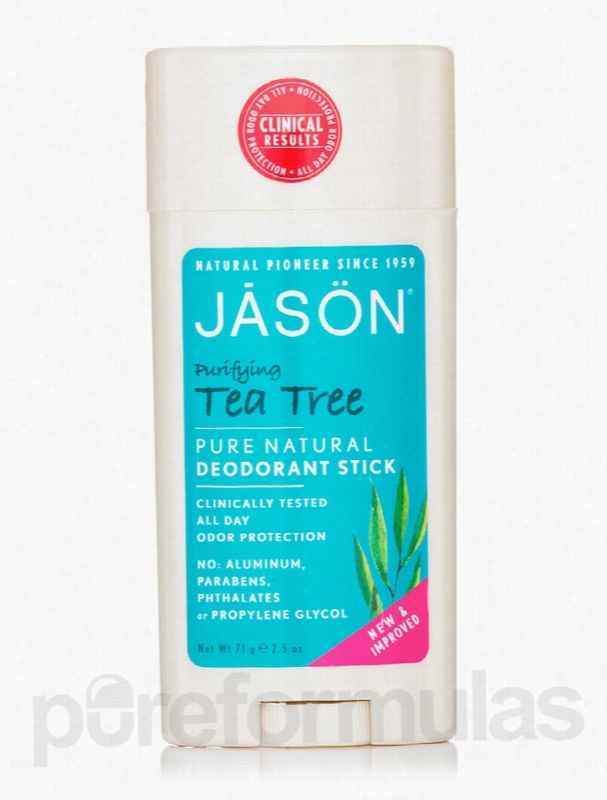 Jason Natural Products Bath and Body - Purifying Tea Tree Deodorant. If you are looking for a product to keep you odor free all through the day&sbquo; why not try Purifying Tea Tree Deodorant Stick 2.5 oz (71 Grams) from Jason&reg; Natural Products. This natural deodorant stick helps in soaking up odors from your body as well as warding off microorganisms that cause these odors. This formula from Jason&reg; natural Products contains naturally sourced zinc ricinoleate. Studies show that this compound could absorb unpleasant odors and helps eliminate them more efficiently than other agents. Corn starch and baking soda present in this deodorant may also absorb odors. Another benefit of baking soda is that it may also destroy odor causing bacteria. Studies reveal that bacteria present in the skin act on protein in the sweat glands to cause an unwanted odor. Tea Tree oil has a pleasant nutmeg like fragrance and appears to have antimicrobial properties. Grapefruit seed extract could also inhibit the growth of microorganisms&sbquo; thereby alleviating body odor especially in damp areas of the body. Get Purifying Tea Tree Deodorant Stick 2.5 oz (71 Grams) from Jason&reg; Natural Products to keep you dry and odor free right through the day. These statements have not been evaluated by the Food and Drug Administration (FDA). These products are not meant to diagnoseÃ¢ÂÂ treat or cure any disease or medical condition. Please consult your doctor before starting any exercise or nutritional supplement program or before using these or any product during pregnancy or if you have a serious medical condition. 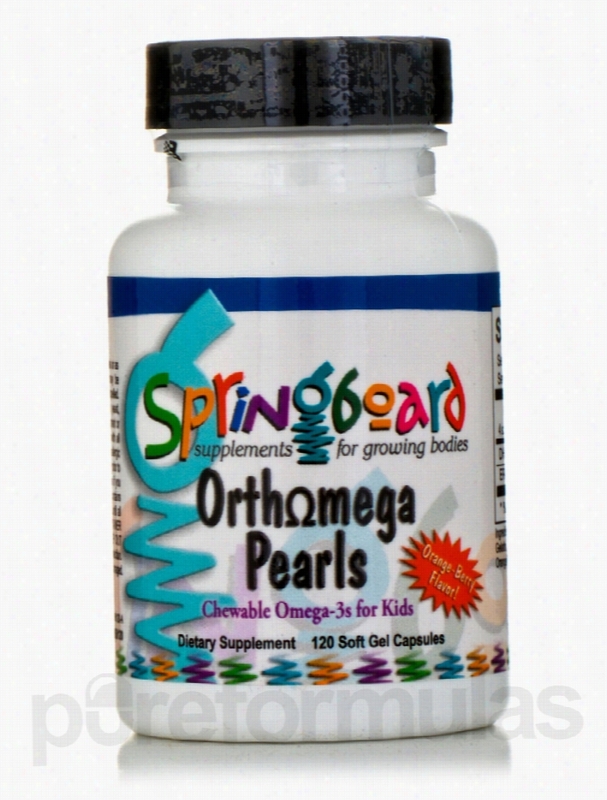 Ortho Molecular Products Children's Formulas - Orthomega Pearls - 120. Omega-3 fatty acids are known as essential fatty acids&sbquo; meaning that they&rsquo;re required for your well-being&sbquo; growth&sbquo; development&sbquo; and Body maintenance. They work to help you maintain cardiovascular health&sbquo; relieve joint pain and stiffness&sbquo; reduce inflammation&sbquo; and prevent illness. Most people don&rsquo;t think about children and their need for omega-3 fatty acids; however&sbquo; they need them just as much as adults. Omega-3s support proper development of organs and tissues&sbquo; as well as immune strength and vision. Perhaps most importantly&sbquo; they&rsquo;re also essential to childhood brain development. You can get Omega-3s through some foods&sbquo; like salmon&sbquo; tuna&sbquo; and flaxseeds. Unfortunately&sbquo; it can be especially difficult to get children with picky palates to consume sufficient amounts. Ortho Molecular Products&rsquo; Orthomega Pearls helps your child maintain overall health&sbquo; with a fruity orange-berry flavor that kids love. Each convenient softgel of Orthomega Pearls provides: Highly purified and concentrated omega-3 fish oil&sbquo; without the fishy taste Gelatin&sbquo; which supports the growth of muscles&sbquo; joints&sbquo; nails&sbquo; skin&sbquo; and hair Glycerin&sbquo; which works as an anti-inflammatory agent that may help relieve skin conditions Natural mixed tocopherols&sbquo; a combination of antioxidants that help boost the immune system Rosemary extract&sbquo; another anti-inflammatory agent Ascorbyl palmitate&sbquo; which works like vitamin C to promote immunity and cell health One bottle of Orthomega Pearls up to a four-month supply when your child takes the recommended dosage of one to four capsules daily&sbquo; in divided doses. These capsules can be either chewed or swallowed for greater versatility. Ortho Molecular Products prides itself on making effective supplements from scientifically designed formulas. For over 20 years&sbquo; they&rsquo;ve been providing proven products with superior raw ingredients. Their manufacturing practices rise above industry standards and regulations. The most important priority for Ortho Molecular Products is that those who use its supplements get and stay healthy as soon as possible. These statements have not been evaluated by the Food and Drug Administration (FDA). These products are not meant to diagnoseÃ¢ÂÂ treat or cure any disease or medical condition. Please consult your doctor before starting any exercise or nutritional supplement program or before using these or any product during pregnancy or if you have a serious medical condition. Jason Natural Products Bath and Body - Soothing 84% Aloe Vera Hand &. Soothing Aloe Vera Hand &amp; Body Lotion from Jason&reg; Natural Products is an organic product that may hydrate and soothe dry and damaged skin. Aloe Vera may be used to heal various skin conditions. Aloe Vera may be rich in anti-inflammatory substances like salicylic acid and Antioxidants like carotenoids&sbquo; vitamins C and E. In addition&sbquo; it contains magnesium that appears to quell itching. Aloe Vera may improve blood circulation in the skin&sbquo; thereby promoting skin health. It could potentially hydrate and moisturize the skin&sbquo; leaving it firm and with a youthful glow. This supplement from Jason&reg; Natural Products also contains Matricaria flower extract that may have antioxidant and anti-inflammatory properties to potentially soothe inflamed skin. Green Tea leaf extract is rich in antioxidants that could protect your skin from harmful free radicals. Panax Ginsing may tone and freshen your skin. 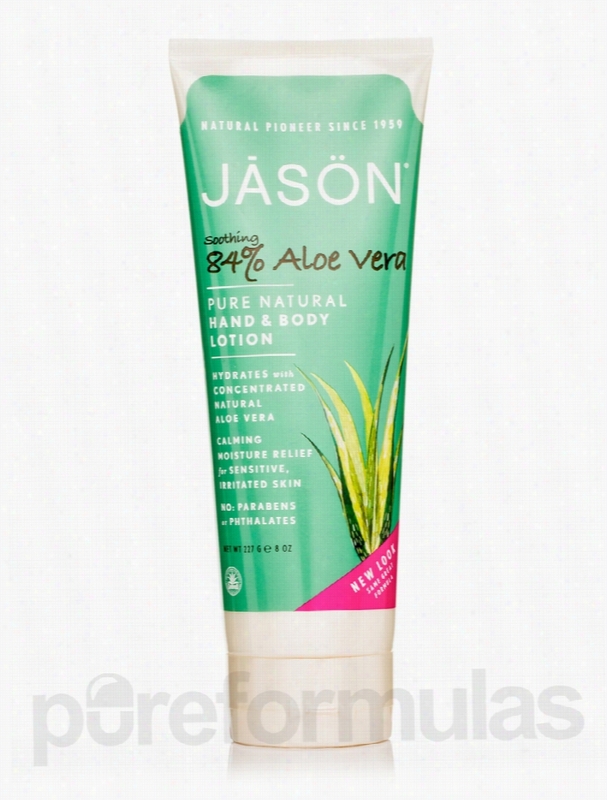 Switch to Soothing 84% Aloe Vera Hand &amp; Body Lotion from Jason&reg; Natural Products to calm and protect your skin. These statements have not been evaluated by the Food and Drug Administration (FDA). These products are not meant to diagnoseÃ¢ÂÂ treat or cure any disease or medical condition. Please consult your doctor before starting any exercise or nutritional supplement program or before using these or any product during pregnancy or if you have a serious medical condition. Jason Natural Products Skin Care - Tea Time (Anti-Aging Moisturizing. Tea Time (Anti-Aging Moisturizing Creme) from Jason&reg; Natural Products is an organic product that may moisturize your skin and maintain a youthful appearance. This unique formula brings together the goodness of green tea&sbquo; vitamins A&sbquo; C&sbquo; E&sbquo; aloe vera and panax ginseng to improve your skin health. Green Tea present in this formula from Jason&reg; Natural Products is rich in antioxidants called polyphenols. These could ward off free radicals&sbquo; which cause damage to the skin. Free radicals are unstable molecules that may deprive cells of oxygen and break down collagen. Green tea might also promote skin regeneration. Vitamin A is required for the normal function of skin; it could smooth rough skin and give it a young appearance. Vitamin C could diminish the aging changes caused to the skin by free radicals&sbquo; leaving you with firm&sbquo; smooth skin. This formula contains vitamin E (Tocopheryl) that may promote a young look by conditioning and maintaining the skin. Aloe Vera may hydrate the skin and maintain a youthful glow. 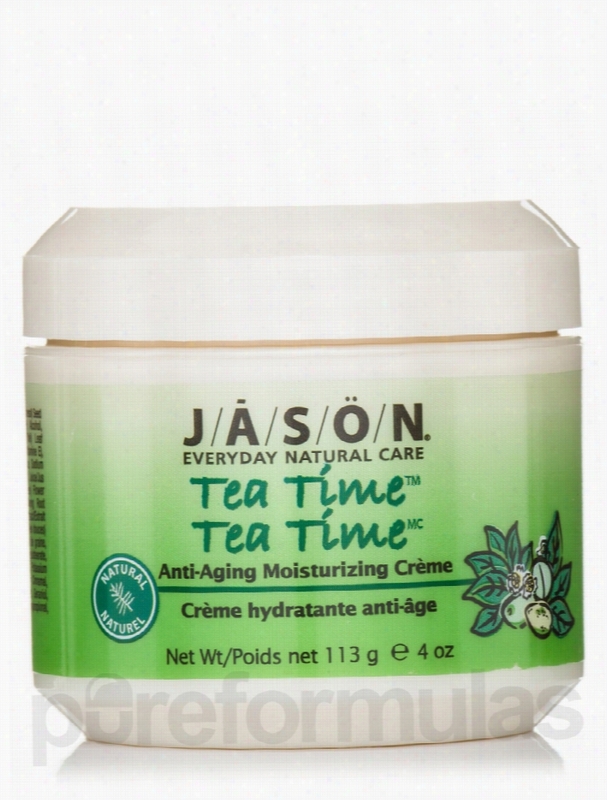 Get Tea Time (Anti-Aging Moisturizing Creme) from Jason&reg; Natural Products and experience better skin health. These statements have not been evaluated by the Food and Drug Administration (FDA). These products are not meant to diagnoseÃ¢ÂÂ treat or cure any disease or medical condition. Please consult your doctor before starting any exercise or nutritional supplement program or before using these or any product during pregnancy or if you have a serious medical condition. Ortho Molecular Products Herbals/Herbal Extracts - Cystistatin - 60. 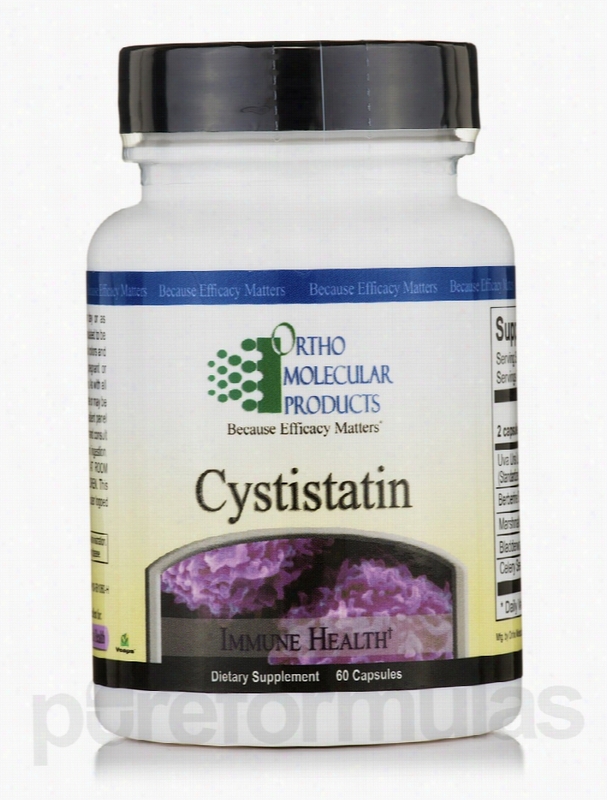 Support the health of your urinary tract and fight infections with Cystistatin from Ortho Molecular Products. This dietary supplement contains berberine sulfate hydrate&sbquo; bromelian&sbquo; extracts of uva ursi leaves&sbquo; marshmallow root&sbquo; buchu leaves&sbquo; and bladderwrack. Uva ursi leaf extract may reduce urinary tract conditions&sbquo; prevent infections of the bladder and kidneys&sbquo; and combat inflammation. It could potentially increase urine output and alleviate painful urination. Studies reveal that uva ursi leaf extract supports healthy bowel movement&sbquo; fights allergies&sbquo; and eases bronchial conditions. The presence of berberine sulfate hydrate in this dietary supplement from Ortho Molecular Products reportedly supports heart health&sbquo; fights signs of aging&sbquo; and alleviates joint conditions. Bromelian&sbquo; an enzyme present in pineapple&sbquo; could potentially ease joint pain and swelling&sbquo; relieve respiratory discomfort&sbquo; combat allergies&sbquo; and reduce inflammatory bowel conditions. Marshmallow root extract may alleviate conditions related to your respiratory tract and digestive system&sbquo; and also prevent urinary tract inflammation. Buchu leaf extract could potentially increase urination and fight bladder infections. Bladderwrack leaf extract in Cystistatin Capsules from Ortho Molecular Products reportedly supports healthy thyroid function&sbquo; relieves digestive conditions&sbquo; and fights joint discomfort. These statements have not been evaluated by the Food and Drug Administration (FDA). These products are not meant to diagnoseÃ¢ÂÂ treat or cure any disease or medical condition. Please consult your doctor before starting any exercise or nutritional supplement program or before using these or any product during pregnancy or if you have a serious medical condition. 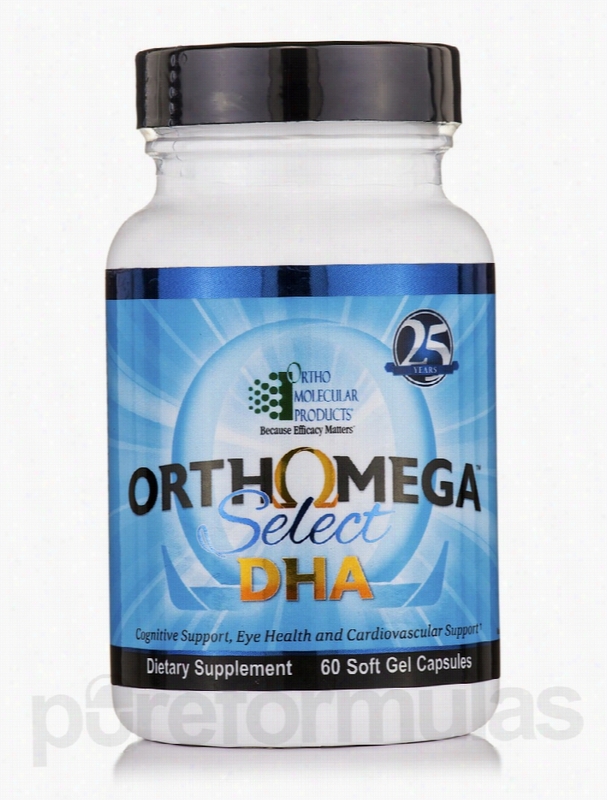 Ortho Molecular Products Cardiovascular Support - Orthomega Select DHA. Everyone knows that in order to survive&sbquo; you must provide your body with the fuel it needs to keep going. Proper nutrition plays a crucial role in the development of a healthy brain. However&sbquo; in today's fast-paced world&sbquo; many people often neglect their Nutritional needs. DHA and EPA are essential fatty acids necessary for proper nutrition. Essential fatty acids aren&rsquo;t produced by the body itself&sbquo; but support the metabolism. During the 1970s&sbquo; researchers studied a tribe of Inuit people and discovered that&sbquo; although the tribe consumed large amounts of fat in cold-water fish&sbquo; their cardiovascular health was very good. It had been widely believed that consumption of any kind of fat wasn&rsquo;t good for your body&sbquo; but with these findings&sbquo; researchers were able to conclude that not all fat is harmful. In fact&sbquo; some fats (namely from fish oil) can actually make you healthier and help you live longer. Just like humans&sbquo; fish don&rsquo;t synthesize DHA and EPA in their bodies; the algae and plankton they eat creates it. Most people are now aware that fish is good for them&sbquo; but it's not always easy or convenient to add enough seafood to your diet. Fortunately&sbquo; there are supplements available to remedy this dilemma. One of them is Ortho Molecular Products&rsquo; Orthomega Select DHA. Each softgel contains both eicosapentaenoic acid (EPA) to promote memory and docosahexaenoic acid (DHA) to support cardiovascular health. At the recommended dosage of one capsule daily&sbquo; each 60-softgel bottle of Orthomega Select DHA should last for about two months. Since 1981&sbquo; Ecological Formulas/Cardiovascular Research has been formulating specialty supplements geared towards individuals with chemical sensitivities. Many of its products are also certified Kosher and/or independently lab tested. These statements have not been evaluated by the Food and Drug Administration (FDA). These products are not meant to diagnoseÃ¢ÂÂ treat or cure any disease or medical condition. Please consult your doctor before starting any exercise or nutritional supplement program or before using these or any product during pregnancy or if you have a serious medical condition. 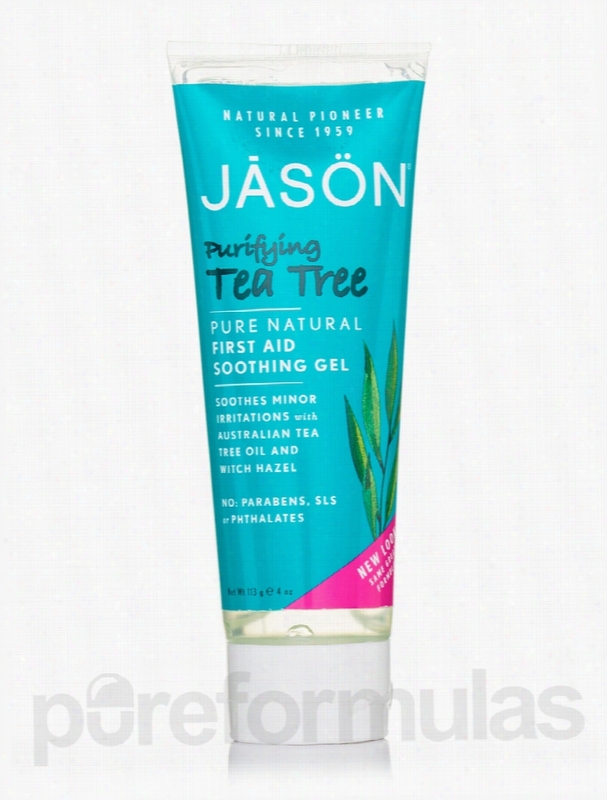 Jason Natural Products Aches and Pains - Purifiying Tea Tree First Aid. Soothe irritations and leave a cooling effect on your skin with Purifiying Tea Tree First Aid Soothing Gel from Jason&trade; Natural Products. Non-oily by nature&sbquo; the gel is formulated with a line of botanicals that may relieve insect bites&sbquo; shaving nicks or small cuts on your skin. You may also use this soothing gel from Jason&trade; Natural products to heal sunburns&sbquo; diaper rashes and bed sores. Witch hazel water appears to reduce inflammation and irritation on your skin. It may also fade away bruises or blemishes on your skin. Tea tree leaf oil and Arnica montana flower extract are innate anti-bacterial and anti-inflammatory agents. They might safeguard wounds and cuts from infections. Calendula officinalis flower extract appears to come in handy in repairing damaged skin. It also helps with skin regeneration. Centaurea cyanus flower extract appears to potentially function as a skin conditioning agent and astringent. This herb could condition and rebuild the affected area and leave smooth feel. You may choose to keep Purifiying Tea Tree First Aid Soothing Gel from Jason&trade; Natural Products handy with you for timely relief from bruises. These statements have not been evaluated by the Food and Drug Administration (FDA). These products are not meant to diagnoseÃ¢ÂÂ treat or cure any disease or medical condition. Please consult your doctor before starting any exercise or Nutritional supplement program or before using these or any product during pregnancy or if you have a serious medical condition. 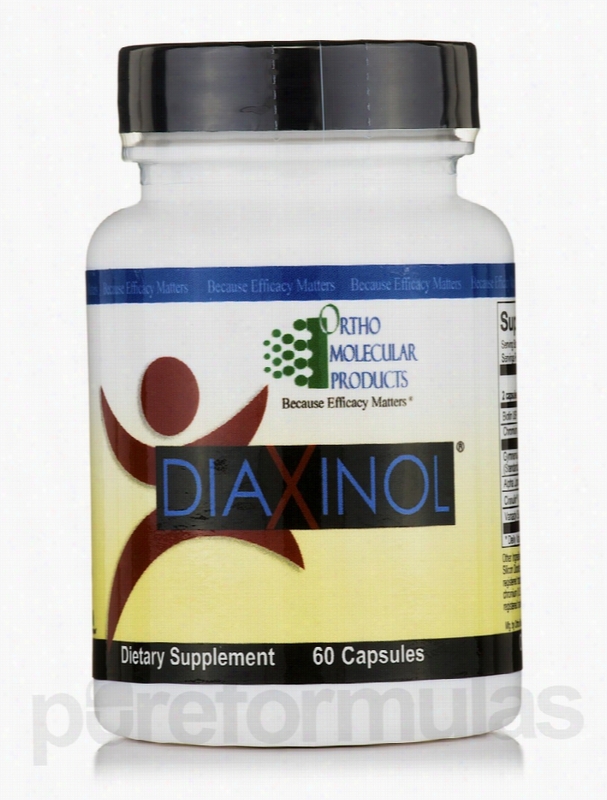 Ortho Molecular Products Cellular Support - Diaxinol - 60 Capsules. Why These Natural Ingredients?BiotinShown to support glycolysis in the liver and pancreas by its promotion of the enzyme&sbquo; glucokinase. Biotin is a key player for persons needing support for glucose uptake. ChromiumChromium facilitates the uptake of glucose into cells&sbquo; working naturally with the body&rsquo;s own insulin. Most multivitamins provide 200 mcg of chromium&sbquo; but additional chromium may be needed for those wanting to maintain healthy blood sugar levels. GymnemaGymnema sylvestre is a plant that is found in the tropical forests of India and in parts of Africa. Extracts of gymnema have been used world-wide for numerous health benefits. The leaves of Gymnema sylvestre have been studied for their role in diabetic health. Lipoic AcidLipoic acid is one of the most beneficial nutrients for those seeking to achieve optimal range blood sugars. Lipoic Acid has antioxidant activity that maintains microcirculation and has been used successfully for over 30 years in Germany. Cinnamon (Cinnulin&reg;)Research has found cinnamon is beneficial in decreasing fasting glucose levels and has beneficial effects on cardiovascular health. Components known as Type A Polymers have been found to give cinnamon its beneficial properties. Vanadyl SulfateFunctioning much like chromium&sbquo; research has revealed that vanadyl sulfate acts to help cells activate transport proteins for glucose uptake. Scientific quantities of vanadyl sulfate have shown significant benefits for individuals in controlled studies. In some people&sbquo; these benefits were sustained for as long as 2 weeks after discontinuation of vanadyl sulfate These statements have not been evaluated by the Food and Drug Administration (FDA). These Products are not meant to diagnoseÃ¢ÂÂ treat or cure any disease or medical condition. Please consult your doctor before starting any exercise or nutritional supplement program or before using these or any product during pregnancy or if you have a serious medical condition. 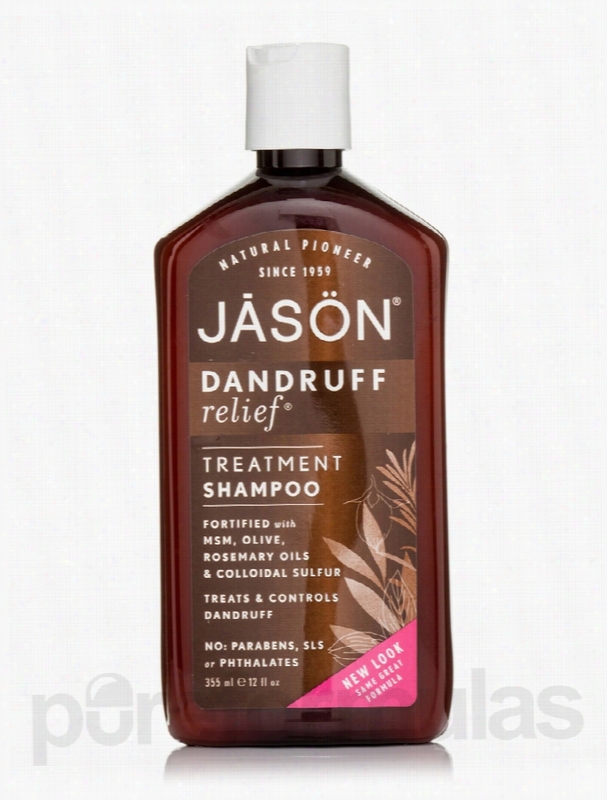 Jason Natural Products Hair - Dandruff Relief Treatment Shampoo - 12. If you are looking for a shampoo that helps cleanse your scalp of flakes&sbquo; why not try Dandruff Relief&reg; Treatment Shampoo 12 fl oz (355 ml) from Jason&reg; Natural Products. This specially formulated shampoo could also keep your hair soft&sbquo; shiny and beautiful. Some of the ingredients in this formula are rosemary leaf Oil&sbquo; olive oil&sbquo; jojoba seed oil along with methylsulfonylmethane (MSM). Research shows that MSM is a naturally occurring sulfur compound that aids blood flow to the scalp and has anti-inflammatory properties. It could help restore balance in the scalp and maintain its health. Olive oil has been in use for a long time to promote scalp and hair health. It is rich in antioxidants and aids blood circulation. It could alleviate dryness and itching associated with dandruff. Rosemary leaf oil&sbquo; present in this shampoo from Jason&reg; Natural Products has antimicrobial and antiseptic properties. It could help protect the scalp from dandruff. It also adds moisture and imparts a pleasant smell to hair. Jojoba oil helps calm&sbquo; condition and heal the scalp. Restore balance in your hair health and fight dandruff with Dandruff Relief&reg; Treatment Shampoo 12 fl oz (355 ml) from Jason&reg; Natural Products. These statements have not been evaluated by the Food and Drug Administration (FDA). These products are not meant to diagnoseÃ¢ÂÂ treat or cure any disease or medical condition. Please consult your doctor before starting any exercise or nutritional supplement program or before using these or any product during pregnancy or if you have a serious medical condition.